I had an interesting discussion on Friday with Roger Parloff on Twitter regarding the records that, Chevron says, corroborate Judge Guerra’s account of his participation in a bribery scheme. I said to Roger that I thought there might be a hearsay problem with the records, and he said (I think he was in court for this) that Judge Kaplan had asked for briefing on just that question. The parties have filed short briefs on the issue. Let’s dive in. In particular, on or about June 24, 2011, Mr. Zambrano deposited $300 into my Banco Pichincha bank account. Specifically, PX 1713 (CVX-RICO-5913098) and PX 1684 include a June 24, 2011 deposit slip, certified by Banco Pichincha, that reflects a $300 deposit made by Mr. Zambrano into my account. The deposit slip bears Mr. Zambrano’s signature, which I recognize from the numerous times I have seen Mr. Zambrano’s distinctive signature, including on orders I prepared for him in the Chevron case and other civil cases. The deposit slip also bears, beneath Mr. Zambrano’s signature, a national identity number of 0906018262. … I affirm once again that the $300 deposit made by Mr. Zambrano was payment for my services as Mr. Zambrano’s ghostwriter. So let’s consider this exhibit, bearing in mind that the only purpose for offering it is to corroborate Judge Guerra’s story. If Guerra were a believable guy, there would be no need for this kind of corroboration. “Authenticity” has a special meaning in the law of evidence. A document is authentic if it is what its proponent claims it is. 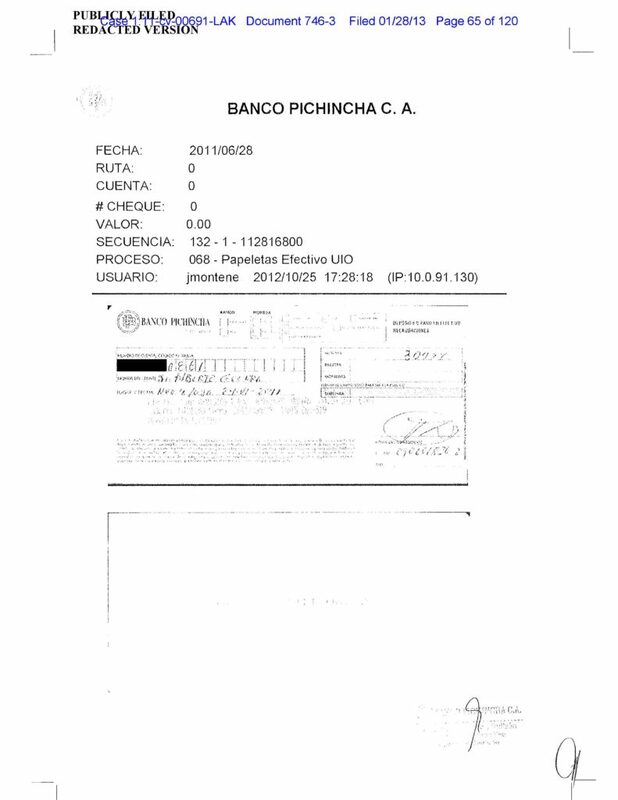 So the deposit slip is authentic if it is a real deposit slip from Banco Pichincha, and not some document that Guerra somehow falsified. In order to be admissible in evidence, all that is required is evidence sufficient to support a finding that the item is what the proponent claims, but even if admissible, the finder of fact could decide that it is not in fact authentic. Roger Parloff, in our discussion on Friday, said that he thought the document was self-authenticating under FRE 902(3). I’m going to assume that that’s so, though I haven’t seen the certifications required under the Rule myself. Even if the deposit slips were not self-authenticating, I think Guerra’s testimony would be sufficient to authenticate them. So let’s stipulate that an authenticity objection will not keep the deposit slips out of evidence, even if at the end of the day the deposit slips are fakes. I think readers can judge this for themselves, but it seems pretty clear to me that the document is not really legible. Feel free to disagree. If I’m right about that, we have to ask whether Chevron should be allowed to offer the poor copy or to rely on Judge Guerra’s account of what the deposit slip says, or whether it should be required to produce the original—which is the best evidence of what the document says—or at least to produce an accurate duplicate. The relevant rule here is FRE 1002, which provides that “an original writing … is required in order to prove its content unless these rules or a federal statute provides otherwise.” An “original document” includes the document itself and “any counterpart intended to have the same effect by the person who executed or issued it.” Under FRE 1003, a “duplicate” is also admissible “unless a genuine question is rasied about the original’s authenticity or the circumstances make it unfair to admit the duplicate.” A “duplicate” is defined as “a counterpart produced by a mechanical, photographic, chemical, electronic, or other equivalent process or technique that accurately reproduces the original.” I assume but am not sure that this is an image of the original made sometime after the fact of the deposit (at least four days later, as the information at the top of the page is dated June 28). Is it an accurate reproduction of the original? Suppose the answer to that question is no. The document still might be admissible under FRE 1004 if, for example, the original had been lost or destroyed, or the original “cannot be obtained by any available judicial process,” or the document “is not closely related to a controlling issue.” It’s hard to say if any of these exceptions would apply, since I don’t know what happened to the original, and since I don’t know what, if any, steps Chevron took in Ecuador to obtain the original. Anyway, there seems to be at least a potential issue here. Chevron says the bank’s assertions come within the business records exception to the hearsay rule set out in FRE 803(6). What are the requirements to lay a foundation for admission of a business record? Guerra’s witness statement doesn’t really even attempt to lay this foundation. Even if it did, I think there’s a real question whether he is a “qualified witness” in these circumstances. Remember, the reason for introducing the deposit slip in the first place is to bolster Guerra’s credibility in light of his admitted prior bad acts. Does it make sense to allow the bad actor to bootstrap in this way? For similar reasons, I question whether the deposit slip should be admitted under the residual exception to the hearsay rule for statements with satisfactory “circumstantial guarantees of trustworthiness.” I see that Chevron has cited a case, United States v. Johnson, 971 F.2d 562, 571 (10th Cir. 1992), for the proposition that the account holder can supply the business record foundation. But even if Johnson were rightly decided, the account holder who authenticated the documents there was not an accused wrongdoer. Even assuming that the bank deposit slip comes into evidence, what about Zambrano’s signature, which is the only thing really tying the $300 deposit to Zambrano? Is the signature itself a statement by Zambrano being offered for the truth of what it asserts, namely that Zambrano was the source of the money? If so, is it admissible as the statement of a co-conspirator? These seem like much closer questions to me, and ones that I wouldn’t want to opine on without working them through. But the answer to the prior question, namely whether the deposit slip comes in at all, seems like a much stronger point for Donziger and the LAPs, and if it’s right, then the court never needs to reach the questions about Zambrano’s signature. What’s the point of all this? At least with respect to this one document, there are significant technical hurdles, in my view, to its admissibility. The same may or may not be true for the other corroborating documents—we’d have to look at those documents in the same way to be sure. So before we simply say that Judge Guerra’s account has been corroborated by documentary evidence, let’s just pause to ask whether the documentary evidence meets the standards of the Rules of Evidence. And let’s also remember that those rules, though highly technical, are there for a reason: to focus the finder of fact’s attention on the sworn testimony of people with personal knowledge of the facts and on reliable documents with a proper foundation rather than on hearsay, or partly illegible photocopies in place of originals, and so forth. Whether all of this meets the Fed R Evidence standards, I have not examined. But for anyone attempting to assess Guerra’s credibility—not generally (he’s a crook), but on the particular allegations that he ghost wrote for Zambrano, and that the LAP’s bribed Guerra—this context cannot be ignored. 2. I don’t know why Chevron did not have an Ecuadorian bank official authenticate the bank records. I do know that any bank official who dared to testify for Chevron would risk losing not only his job, but also his bank’s license to operate in Ecuador. That, too, is part of the realistic context that an evidentiary analysis should take into account. President Correa does not play by the Federal Rules of Evidence. Chevron’s main claim against Guerra is that he took part in a pretty sophisticated scheme to falsify things for money. So since Chevron is now paying him a fair amount of money, it’s not unreasonable to wonder whether documents that he offers to support his story are trustworthy. That’s why it would be good to see a third party standing behind the documents. I suppose the same is true, in principle, for the hard disk, but it’s probably harder to create a convincing electronic fake. If we’re supposed to believe the documents are for real on Guerra’s word alone, then leaving aside the Rules of Evidence, isn’t there a real circularity problem? Why is any document Guerra vouches for supposed to be trustworthy? On a more technical level, look, either the documents are admissible or they’re not. And it’s Chevron’s burden to show that they are admissible. If there’s one thing Chevron has shown in this case, it’s that it can get the evidence that supports it case! So if the concerns I expressed about the Zambrano document are warranted, then that’s that, right? I should add that I am not asserting that the deposit slip is a fake, or even that Judge Kaplan should not credit Judge Guerra’s testimony. But I think we both are on record as saying that in light of the obvious credibility problems here, corroboration is important. 1. The version of the bank deposit slip pasted into your post is stamped “publicly filed redacted version.” That suggests that Chevron has the original, or at least a better copy, and that Chevron may have filed it with the court in camera or under protective order. 2. All the bank deposit slips — there are several others — have the bank’s logo and the stamp of a bank official with initials superimposed. 3. Guerra also submitted copies of his bank statements, also with the bank logo, showing the same deposits on the same dates. 4. The TAME airline shipping records bear the company logo and the purported signature of a company legal officer. 5. Short of calling bank and airline officials as witnesses — which, as I explained above, is not practical unless they, too, like Judge Guerra, decide to flee Ecuador — I don’t know what more Guerra or anyone could do to authenticate the bank and airline records. 6. Chevron, as I recall, had independent technical experts examine Guerra’s hard drive to determine the dates of the files. We have no reason to believe that Guerra is a computer geek, capable of outfoxing the techies (even if that were technically possible). I understand that you are not drawing bottom line conclusions on the authenticity of the records, or on Guerra’s credibility on these particular points, but are merely raising good questions about admissibility under the Federal Rules of Evidence. I do not claim to know how the Rules apply here. On the other hand, if the Judge finds the corroborating documents inadmissible, Chevron’s case on these points would depend, as you rightly note, on whether the Judge finds Guerra’s testimony on these points credible — in the context of all the other evidence in the case, including plaintiffs’ counsel’s internal emails, and their track record of fraud in the case, including their falsification of the court expert’s damages report (detailed in the witness statement submitted this March by their former chief environmental consultant, Douglas Beltman) and the evidence that they bribed the court’s expert as well. Thanks, Doug, for the reply. Here are my replies to your various points. 1. You could be right. My guess is that you’re not, but I don’t know for sure. 2-4. These points don’t help with the hearsay problem. Without more, they also don’t help with the authenticity issue, though as I noted in the post, Judge Guerra’s testimony is sufficient to authenticate the documents. 5. You could be right, but there’s no “circumstances beyond my control prevent me from laying a proper foundation” exception to the hearsay rule’s business records exception, at least as far as I know. 6. I would need to look into this—I don’t think I know enough to comment. 7. I don’t disagree with you that circumstantial evidence could corroborate Guerra’s story. You write: “However, aside from the technical rules of admissibility, I find the cumulative corroboration of Guerra’s testimony sufficient to make out a prima facie case that he is telling the truth on these points. In other words, it seems to me that it is up to the plaintiffs to provide convincing rebuttal of the corroborative documents, and if they fail to do so, I would take them as true.” I assume you’re talking about how someone outside a courtroom could reasonably think about this, and not about how a finder of fact in court should proceed. If you are talking about how a court should act, then I think you’re just wrong about this. You are correct in your last paragraph that I am talking from the perspective of what I think are reasonable conclusions by an analyst outside the courtroom. Inside the federal courtroom, of course, the Federal Rules of Evidence govern, and I take no position on how those Rules apply. Without research in an area I have not dealt with since I was a U.S. litigator decades ago, I have no independent opinion on how much flexibility the court may have in applying the rules. The main point here is that in Ecuador you could sign the deposit slip under any name. You could even sign as Mr. Barack Obama (to use any fake name) and there is a huge probability that your deposit is accepted. The deposit slip should not be taken as a probative document. The lawyers of Chevron should tell the full story to the judge, and warn the judge of the existence of such probability … otherwise, the Chevron legal team could maliciously try to get the judge to reach a decision with a huge probability of error. Thanks, Gustavo, for the comment! I defer to those who know how these things work in Ecuador. I have no personal knowledge of Ecuadoran banking practices. I will say, though, that if the question is whether the Zambrano signature is authentic, Chevron has both a burden of production and the burden of persuasion. It met its burden of production by offering testimony from Judge Guerra that the signature was, in fact, Zambrano’s. Ultimately, Chevron has to persuade the judge that this is so, but if there is any evidence that it’s not Judge Zambrano’s signature, then it would be to the advantage of the LAPs and Donziger to bring such evidence forward.